LG’s 4K OLED TV range was the market leader in colour accuracy, picture quality and the high end product of choice for 2016. Looking at what has just been unveiled at the Consumer Electronics Show (CES) in Las Vegas, there’s a good chance they might carry the same accolade for 2017. Amongst other things, the 2017 OLED range is been said to be 25% brighter than their 2016 counterparts. The best screens from 2016, just got better. There are 5 models in the range - namely the B7, the least expensive in the range, the C7, E7, G7 and the flagship W7. So what does each model offer? Each and every model in this range comes with a 3,840 x 2,160 pixel screen, meaning that whichever you invest in, you are ensured a dazzling visual OLED experience. The whole range will soon support Dolby Vision, HDR 10, HLG - Hybrid Log Gamma and Advanced HDR by Technicolor. It is the cheapest in this range and comes in a 55” and 65” screen sizes. The next one up in the range is the C7, which has a bezel design, an aluminium stand and in-built speakers. This one is also available in a 55” and 65” panel sizes. The mid-range model comes in a choice of 55” or 65” screen size, has in-built speakers and like the B7 and C7, sports a ‘picture on glass design’. Nearing the top of the range now with the G7, which is available in a choice of 65” or 77” screen. The extra investment you would make by choosing this model wouldn’t just go on a bigger picture, but also on an in-built, foldable soundbar, improving the audio output on standard in-built speakers. Whilst the G7 isn’t considered ‘Ultra’ slim, it is still elegant and slender. An incredible 2.57mm thin screen is the most striking part of this TV. It is so slight that it hangs on the wall like a poster and it attaches to the wall with simple magnets. 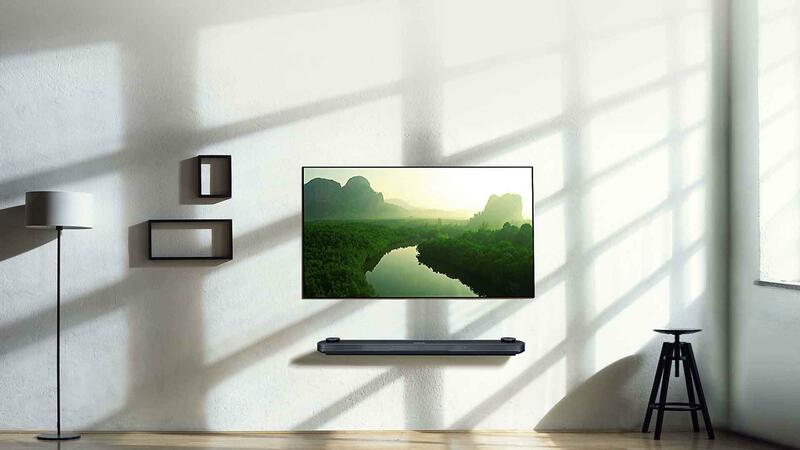 A real game-changer in the world of slim wall-mounted TVs. In order to make the W7 so slim, all the internals and connections are housed in the included soundbar, which have ‘pop-up’ speakers. This makes this TV not only visually, but audibly brilliant. Contrary to what you might think, there is no cost to the picture quality as a result of thinness. This is very much an OLED as we know. Possibly the best ever. Whether it’s worth the estimated cost remains to be seen. For more information on any of these technological marvels, or anything else set for release this year, why not visit our website www.simplyelectricals.co.uk for a ‘live chat’ or visit our Bolton store for a chat with one of our friendly experts. When we get more information on this range, you’ll be the first to hear about it.